On the first day of his classes with university students in Kenya, Dr. Maik Gibson would always ask, “How many languages have you spoken in the last week?” The answer was usually at least three or four—rarely as few as two. The fluidity with which Maik’s African students shifted from one language to another astonished him and prompted him to shift his focus from linguistics to sociolinguistics. He began to explore how languages are used in society, and loved unpacking with his students the sometimes unexamined reasons behind why they used the languages they did, when they did. What did it feel like to choose one language over another, he wondered, and in what ways were feelings driving those choices? One intriguing example of this arose as he interacted with local students who were preachers. Although their congregations mostly spoke the language of Swahili best, they nonetheless preached in English. There were many factors that influenced this decision—for example, they’d received their theological training in English—but digging into that fascinated Maik. It wasn’t just that their conversations provoked insight; it was also, Maik says, that the students were sometimes able to point out to him where his understanding was wrong. That’s quite something for a man like Dr. Gibson to accept. Maik laughingly describes himself as being a “geeky” thirteen-year-old when he decided he wanted to study linguistics—but says he was into languages well before that. By the time he’d finished his doctorate, in addition to his native English he’d studied French, German, Latin, and Russian, picked up Spanish at University, and then learned Arabic (that’s seven languages, if you’re counting). Although his desire to study linguistics initially meant that he intended to become an academic, Maik ended up joining SIL International in the middle of his doctoral program… which is what brought him to Kenya as a teacher, early on in his career. To learn from your students takes humility. But a good teacher is also a lifelong learner, and Maik kept on learning as he spent the next twenty years working with SIL. He got married and had three children (now all teenagers), and is completing his first project as a consultant with SIL LEAD, in the Democratic Republic of Congo. The lessons he had learned in Kenya and along the way stood him in good stead recently with SIL LEAD as he worked closely with the Congolese linguist Dr. Bagamba Araali to conduct a survey of the efficacy of recent attempts to implement wider use of local languages in the Congolese school system. This was no easy task. First, because there are three levels of language in Congo: French, four national languages, and over two hundred vernacular languages. In an ideal world, every child would be able to learn in the language he or she understands best (as has been the experience of most people reading this). But with such a wealth of languages in their country, the Congolese have had to make some hard, practical choices. 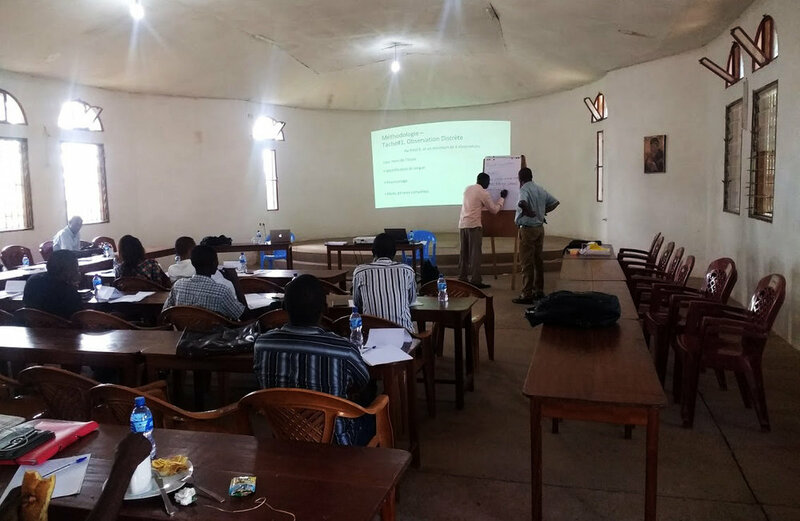 Dr. Gibson and Dr. Araali were tasked with running four one-week workshops in which they trained local Congolese enumerators to go out and conduct surveys in various communities—both in the more urban areas, and in rural communities. Maik says it was wonderful working so extensively with Congolese people (he only met one westerner the entire time he was in the country). He was able to use his knowledge and experience to help his Congolese colleagues study their educational practices, and then to formulate a response that they could implement to improve their outcomes. This local approach is a perfect expression of how SIL LEAD prefers to engage with communities, and it’s the sort of task that Maik’s long experience had perfectly equipped him to accomplish. It’s impossible to know ahead of time what will come of these sorts of initiatives. But Maik has already analyzed the data (he’s returning to Kinshasa in October to formally present the results with Dr. Araali), and has been pleased to discover that because the task was assigned by those with the authority to effect change, the suggestions that he and his colleagues came up with for improvement have already begun to be implemented. Children’s lives will be impacted. As Congolese schools become better equipped to teach them in ways they can understand, so much more of the incredible potential of the Congolese people can begin to impact their nation for the better. No one knows for sure when they start out where their path will lead. Dr. Gibson began with a desire to study linguistics and become an academic. And while he undoubtedly would have made a wonderful full-time University professor (he does currently teach at Redcliffe College in Gloucester, UK), we at SIL LEAD are grateful for the way that dream has evolved to allow him to work with us to make a real difference in the lives of children in the DRC.